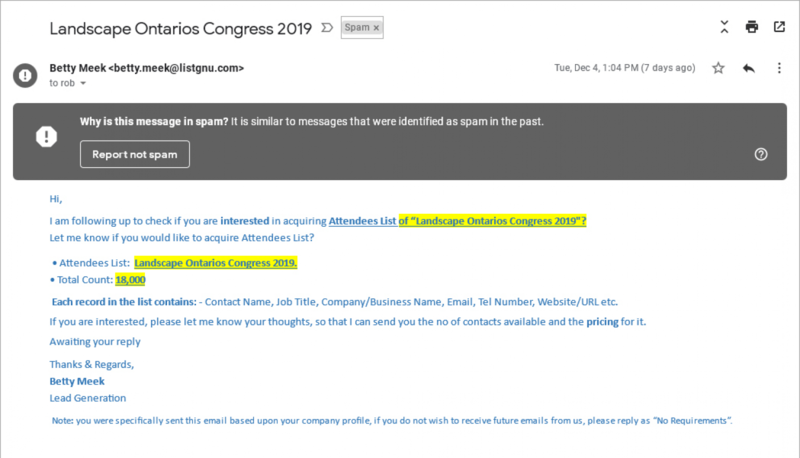 Landscape Ontario members have noted receiving emails from various marketing and lead generation firms, claiming to have attendee lists for sale for Congress 2018, Congress 2019 and other industry contacts. 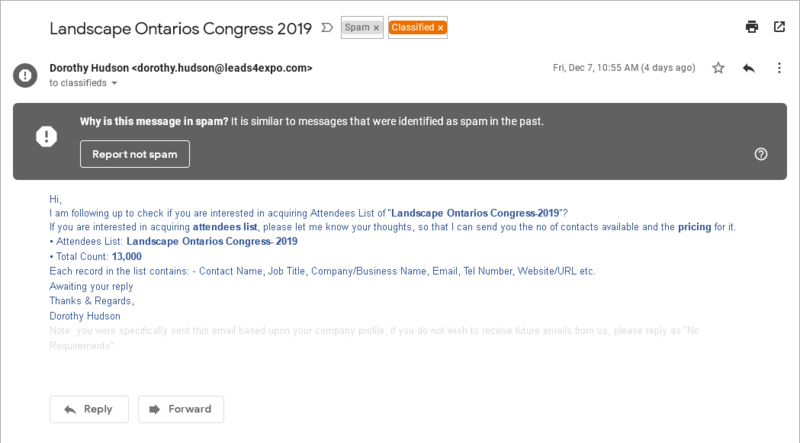 These emails are not from Landscape Ontario, nor does Landscape Ontario ever sell such private and valuable lists to any marketing companies or third-parties. Measures are in place to keep our lists secure. We do make lists available only to members in a limited format for an administration fee. This format does not include email addresses. Landscape Ontario takes the privacy of members, suppliers, and those who conduct business within the profession very seriously. One of the benefits of membership in Landscape Ontario is the access to real, legitimate companies who have a proven history of conducting business in a respected, ethical and fair manner. Landscape Ontario, Congress and LO members are not the only ones targeted by this email scam. Many other trade shows, events, organizations and industries are targeted as well. For years, Landscape Ontario has received emails claiming to have lists for sale from other trade and consumer shows. As an association, we are aware of these false claims. Your safety is our concern. 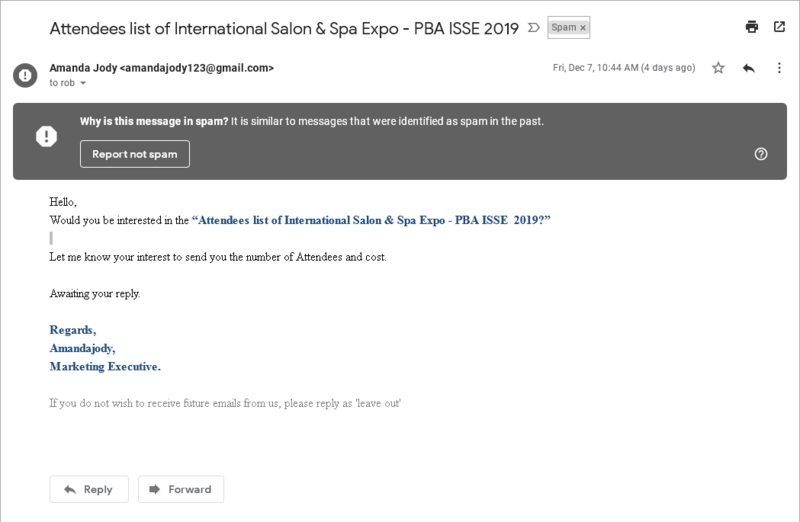 For this reason, we have provided a few current examples below of the emails that have been circulating, and some general tips to help you spot fraudulent messages. Do you recognize the sender's name or email address? Is there a personal greeting or just a general salutation? Does the message contain proper spelling, grammar, punctuation and sentence structure? Is there a proper email signature. Is there a phone number or mailing address? Is there a link or info to unsubscribe? Has your mail program flagged the message with any warnings? Do you recognize the sender? Any legitimate business looking to actively engage customers would want you to see their brand, logo and contact information to close the sale or answer any questions. The suspect message below contains no company name, no phone or fax number and no mailing address. Is there a personal greeting or salutation? Addressing a potential business contact with "Hello" or "Hi" and not with a specific name is sometimes used. It is possible for people to get your first name if it's part of your email address, but with tens of thousands of automated messages being sent, it's much easier to use a generic greeting. Of course there are exceptions and data mining methods and techniques are constantly changing. Another clue is receiving multiple messages from the same person, all very similar, but offering something different for sale, or emails from many different email mail addresses all offering to sell you the same thing. Repeated messages are most-likely false. Is there bad spelling, grammar and punctuation? Bad spelling, lack of punctuation, and bad grammar. In the example below, periods and commas are missing, words are incorrectly capitalized, and sometimes simple sentence structure is ignored or seems awkward. Many large spammers are from other countries, where English may not be the first language and they rely on translation software to get their indented message across. If it doesn't sound right, it probably isn't. Anyone doing business would want to project a professional, polished image. These mistakes all add up to let your email software suspect messages in the first place. Is there a proper email signature, detailed contact information and a way to unsubscribe? Legitimate businesses would want you to contact them for more information or to place an order. Ant-spam laws in Canada also include strict guidelines where business communications must clearly state information on the business sending the communicating, including a link that enables the receiver to unsubscribe from future communications. Does your email program suspect the message is Spam? Data mining uses information found on popular websites to target specific groups or users. Congress is not the only show targeted by this campaign. Look for the warning signs. Most email applications indicate messages that may be spam using icons and visuals warnings, and give you the option to report spam to central databases. A general guideline that applies to all offers also rings true when looking at fraudulent emails, "if it sounds too good to be true, it probably is."